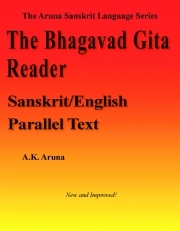 Description of "The Bhagavad Gita Reader"
The fourth title in The Aruna Sanskrit Language Series is The Bhagavad Gita Reader: Sanskrit/English Parallel Text, consisting of all eighteen chapters of the Bhagavad Gita. It presents on each left hand page the Gita verses, then on the opposing page the same verses in easier to understand prose order and an English translation of those verses, in columnar format. The purpose of this section and its design is three-fold. First, you are instructed to read Gita verses daily. Reading skills are encouraged and developed so that you can read Sanskrit text as effortlessly as your native language. By reading down each of the respective pages, the student can quickly read either the original verses, the prose version, or the English rendering—as well as relate these three by reading across the opposing pages. Later understanding of what you are reading follows and is greatly enhanced by this exercise. Secondly, the prose presentation of the verses quickly brings you to an understanding of the meaning of the verses, well before the difficult skill of unraveling the grammar packed into verse form. Breaking with tradition, all words in the prose are grammatically split apart, helping you see the individual words with their full grammatical form. Interspersed in the prose in parentheses are additional Sanskrit words necessary to help you comprehend the meaning and context of certain words, and to understand the not so obvious references of certain pronouns found in some verses. Thirdly, the English translation is given out-of-the-way in its own column to de-emphasize your dependence on English as a medium for understanding Sanskrit. This translation doubles as a quick answer key to the Aruna Coursebook exercises, which are all cross-referenced to the matching verses. Additionally, contextual explanation is added in parentheses so as not to mislead the reader into confusing editorial commentary with the actual translation. This is a feature sorely lacking in existing translations that I have come across. Certain Sanskrit words that have a depth of technical and cultural meaning packed into them, or intentionally have multiple meanings, are well explained in the Aruna Coursebook and in The Bhagavad Gita Dictionary. After being initially translated, the original Sanskrit word is then used in the English translation of the following verses and is clarified, if necessary, only in parenthetical commentary. This makes for better readability of the translation, during this language study and especially after this study—once you realize that there are no equivalent, concise expressions in English for certain Sanskrit words, nor need they be manufactured. Reviews of "The Bhagavad Gita Reader"